petroMESH was established in 1997 and is headquartered in Calgary, Alberta Canada – the heart of the Canadian oil and gas and petrochemical industry. 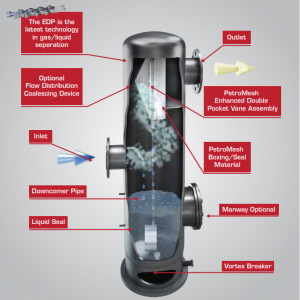 Our goal is to supply the competitive mist elimination equipment of the highest quality and quickest delivery in the market. 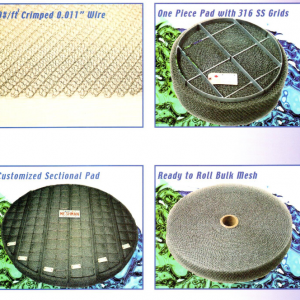 Products include knitted wire mesh mist eliminator pads, now marketed under the trade name petroMESH DEMISTER® and Enhanced Double Pocketed (EDP) Vane Packs (US Patent 8,444,732) enabling the smallest vessels to be used in gas liquid separation applications. petroMESH has grown into a worldwide company offering complete gas liquid separation solutions and engineering services. We utilize the most advanced manufacturing technology in the industry and are dedicated to ongoing innovative solutions through our superior research and development unit. Inside our R&D department you will find sophisticated equipment including our wind tunnel lab and computer fluid design (cfd) capabilities. Petromesh Inc. (petroMESH) is closely affiliated with Industrial Process Products Ltd. (IPP) who market our products worldwide through local representatives such as SME Associates. Our success is due to providing consistent prompt customer service and high quality products. Our rush delivery combined with specialty design solutions utilizing our innovation and R&D qualities allow us to succeed globally.